A friend recently mused how she was unable to feel gratitude these past two weeks, especially in the face of the Harvey Weinstein story and the implosion of the “Me Too” response. Her comment gave me pause. How was it, in spite of all the awfulness, I am able to come up for air, take deep breaths, seek and find moments of gratitude. It’s about belief. I believe in balance. I believe nature provides balance and in as much as human beings are part of the natural order, the striving for balance is dormant within us. The challenge, as I try to describe through this blog, is in the seeking and recognition of meaning. For each of us, it is different. 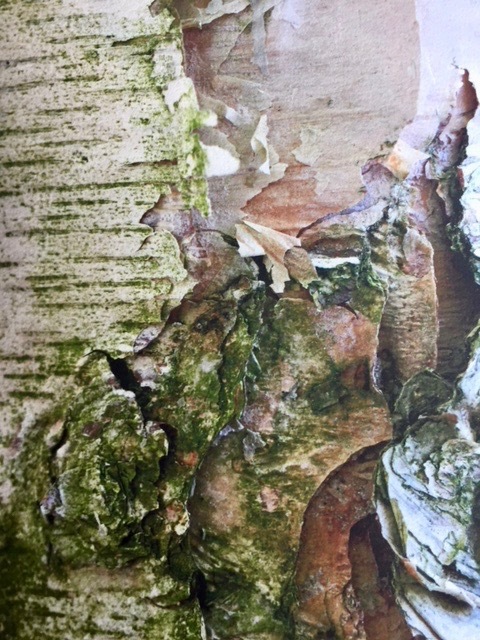 To my friend, a talented artist whose soft edged images of slices of white bark trunks invoke the impulse to touch, I am grateful. Her talent in seeing and transmitting what she sees invokes my connection to nature. Is this not how as human beings, we are wired? Has not the Me Too outpouring of the experience of hurtful boundary violations given rise to the opportunity for hidden voices to be seen and heard? In The Boston Globe, October 21st column, “Me Too? It Was Started By Her,”Christela Guerra interviews Tarana Burke, who “originated the idea a decade ago through her work, particularly with young women of color.” I was grateful to read about Burke’s original intentions. In many regards Me Too is about survivors talking to survivors. It was never really about amplifying the number of people who are survivors of sexual violence. It was about survivors sharing empathy with each other. But when I talk to young people, I use pop culture to promote the idea of Me Too all the time. We have to have something that reaches the masses. Empathy is key. As a therapist, I specialized in treating women who had been sexually abused as children. Many came to therapy because of symptoms, the source of which they had dismissed or forgotten. Me Too is a call to women to speak out on serious boundary violations, which require the empathy of others to bear witness for healing. As a woman of 85, I have experienced sexualized verbal and physical assaults. My first incident, at five years old, I was chased around my dining room in the presence of close family who laughed as my father’s friend grabbed inside my dress and placed his hands far down my back to grab the “bugs” inside. I screamed; everyone laughed. Boundary violation, Yes. “Boys will be boys,” the unempathic and uninformed explanation. If your Me Too was about sexual harassment versus sexual assault but it’s traumatizing to you, then it’s important for you to be heard and seen. The memory of strange and icy hands on my back has never left me. It likely planted seeds of gratitude for empathy and the humanness in a response that says you are not alone. This entry was posted in Creativity, Currents, Mindfulness, Nature, Relationship(s), Uncategorized, Well-Being, Writing and tagged bear witness, harassment, Me Too, sexual assault on October 23, 2017 by fayewriter.